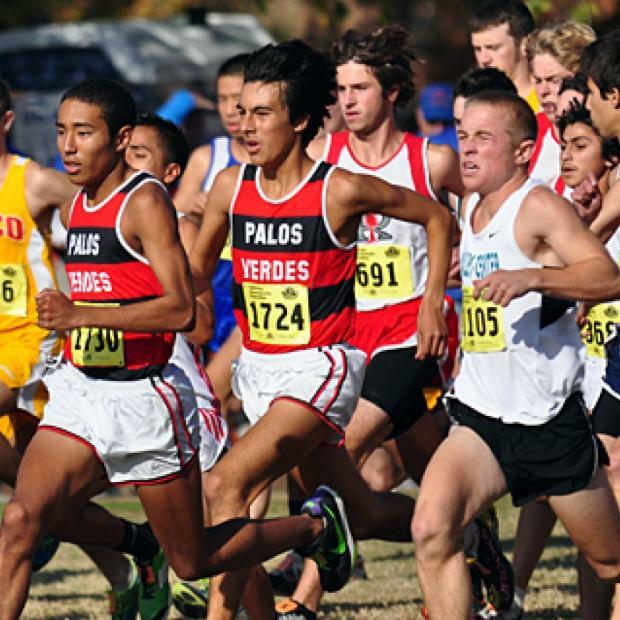 Friday, September 28th, will mark the 14th running of the modern Palos Verdes Invitational, with the original meet dating back to circa 1975. The PV Invite is known for a 2-mile course that tackles the fabled Agony Hill and features one-on-one races, so that the #7 runners have their own race, the #6's, and so on, culminating with the #1 runners showcased on the big stage. The team champion is crowned by totaling a team's best 5 positions out of the 7 varsity races, so a 1+1+1+1+1 = 5 is a perfect score. We can speculate at the lineups we might see on Friday for some highly anticipated showdowns. The varsity boys' races look to feature a great battle for the team title. Featured teams include host Palos Verdes (D3 SS#1), Trabuco Hills (making their fist trip to the PV Invite), Cathedral Catholic (San Diego Section), and Flintridge Prep (D5 SS #2). The individual contest within the boys' races figure to be full of drama as well. Josh O'Neill (Trabuco Hills), Will Teets (Palos Verdes), and Wade Nygren (Palos Verdes) enter with respective 3 mile times of 14:33, 14:57, and 14:59 at the recent Cool Breeze Invitational and they all figure to be fighting for the fastest time of the day! Additional potential frontrunners include Kentaro Vadney (CAMS), Max Wilson (Cathedral Catholic), Carson Hasbrouck (Flintridge Prep), Shea Smith (Pacifica GG), and Ewan Macfarlane (Peninsula). 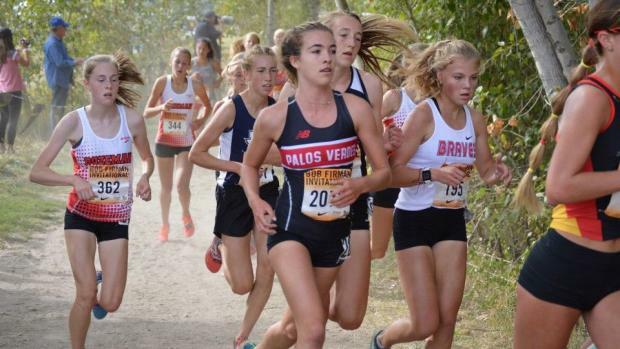 The varsity girls' team races should have multiple close finishes between host Palos Verdes (D3 SS #1), Trabuco Hills (making their fist trip to the PV Invite), Cathedral Catholic (San Diego Section), and Pacifica (Garden Grove). The class of the girls individual field is Savannah Scriven of host Palos Verdes. Scriven has posted a 17:03 3 mile and top-10 finishes in the elite races at the Cool Breeze Invitational and the Bob Firman Invitational in Idaho (Josh Ornales photo at right). Also expected to post fast times are Maxine Arambulo (Cathedral Catholic), Tait Vigeland (Mater Dei), Audrey Simpson (Pacifica GG), Emily Leeb (Pacifica GG), Samantha Steman (Palos Verdes), Dani Barrett (Wildwood), and Bailey Watts (Trabuco Hills). Teams Entered: Ambassador, Beverly Hills, Bishop Montgomery, Cabrillo (Long Beach), California Academy of Math and Sciences, Cathedral Catholic, Da Vinci (Wiseburn), Downey, Flintridge Prep, Hawthorne, Lawndale Leuzinger, Long Beach Poly*, Malibu, Mater Dei, Oxford Academy, Pacifica (Garden Grove), Pacifica (Oxnard), Palos Verdes, Peninsula, Redondo Union*, St Mary's, St Michaels, St Pius X St Matthias, Trabuco Hills, West Torrance*, Wildwood. MileSplitCA editor Jeffrey Parenti contributed to this report.